IBI Scientific’s Semi-Dry Blotters are electrophoretic devices designed for fast, efficient and economical transfer of proteins, DNA, or RNA from polyacrylamide or agarose gels onto a solid membrane support. These membranes can be visualized by staining or other immunological methods. The units consist of a specially designed and tested cathode plate cover and a graphite anode plate. A trans unit stack is formed by the gel and the membrane being in contact and sandwiched between filter papers soaked in buffer. An electric current is applied perpendicular to the gel and buffer saturated filter papers. Bands from charged molecules of the gel migrate and bind to the membrane and this is dependent upon molecular size and charge. Several stacks of trans-units can be run simultaneously. The IBI4400 allows up to six trans-units to be run at the same time. 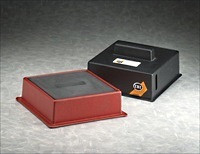 The IBI4500 unit is designed for multiple gel transfers, 2-D transfers and larger gels up to 24 cm × 30 cm. The graphite plates serve as the electrodes, which dissipate potential heat build-up during the electrophoretic transfer. Band transfer times vary due to gel type, membrane type and amount of current applied.